If you have read my prior posts on taxes, you already know my views on the US tax code, especially as it relates to corporate taxes. Without mincing words, the US corporate tax code, as it existed in 2017, was an abomination, a carry over from a prior century where the US was the center of the global economy and companies would do anything demanded of them, to preserve their US incorporation. I was therefore predisposed to favoring tax reform and Congress delivered its version towards the end of 2017. While the process was messy and partisan, it represents the most significant change in corporate taxation in the United States in the my lifetime, and as with all tax reform, it is a mix of the good, the bad and the ugly, with your political priors determining which one you believe dominates. No matter what you think about the tax reform package, there is the one thing that is not debatable: it will impact equity value and affect corporate behavior in the coming year. Corporate Tax Rate: The federal corporate tax rate on the income that corporations generate ion the United States has been lowered from 35%, at the federal level, to 21%. This is the portion of the bill that attracted the most media attention, primarily because of the magnitude of the drop, bringing corporate taxes in the United States down to levels not seen in the country since the second world war. Treatment of Foreign Income: The other big change in corporate taxation that attracted less attention but my be just as consequential in the long term is that the US has now joined the rest of the world, replacing its global tax with a regional tax model. Put simply, until 2017, US companies were required to pay the US tax rate on all of their global income, though the differential tax on foreign income does not have to be paid, until repatriated to the US. Starting in 2018, US companies will have to pay only the foreign taxes due on foreign income and will be free to bring the money back, when they want. There are two ancillary changes that the package makes to foreign income. First, it tries to clean up for past sins by imposing a one-time tax to un-trap cash that companies are holding in foreign locales. As I noted in this earlier post, the trapped cash is a predictable side effect of the global tax model, and not surprisingly, companies with global revenues have built up more than $2 trillion in foreign cash cash balances. The one-time tax rate will be 15.5% on cash invested in liquid assets and 8% on harder-to-sell assets. Second, the tax code also tries to put in disincentives for companies moving intangible assets to tax havens, by imposing a minimum tax rate of 13.1% (rising to 16.4% in 2025) on excess profits (over and above a 10% cost of capital) earned in foreign subsidiaries. This seems to be specifically directed at technology and pharmaceutical companies that have found ways to create foreign subsidiaries for intangible assets. Limitation on Interest Deductibility: For the first time, the US tax code will put a limit on the deductibility of interest expenses, restricting it to 30% of the "adjusted taxable income" (with taxable income defined as EBITDA through 2022 and EBIT thereafter). To provide a cushion for companies that may have cyclical income, the lost (non-tax deductible) interest expense deductions can be carried forward and used in future years, with no expiration date. Capital Expensing: US companies will be allowed to deduct their investments in tangible assets in the year of the investment, for taxable income calculations, rather than have to depreciate it over time. This provision will remain intact until 2023 and be phased out by 2027. The two best features of the tax reform package, in my view, are the changes in the taxation of foreign income and in the treatment of debt, and I will trace out the consequences for value in the next section. There are three features of the tax reform that I do not like. First, the package does little to reduce the complexity in the code, and in some cases, adds to that complexity. In particular, I don't like either the capital expensing rule change or the way in which it deals with intangible assets overseas. Second, I don't believe that tax codes are good instruments to do economic engineering and I don't think that the provisions that are in the changed code to encourage companies, especially in old-economy sectors, to reinvest more will make a significant difference. Third, by increasing the divergence in tax rates between individual income, pass-through business income and corporate income (the highest marginal federal tax rates will be 37%, 29.6% and 21% respectively), it is going to encourage tax gaming on the part of those who have a choice. 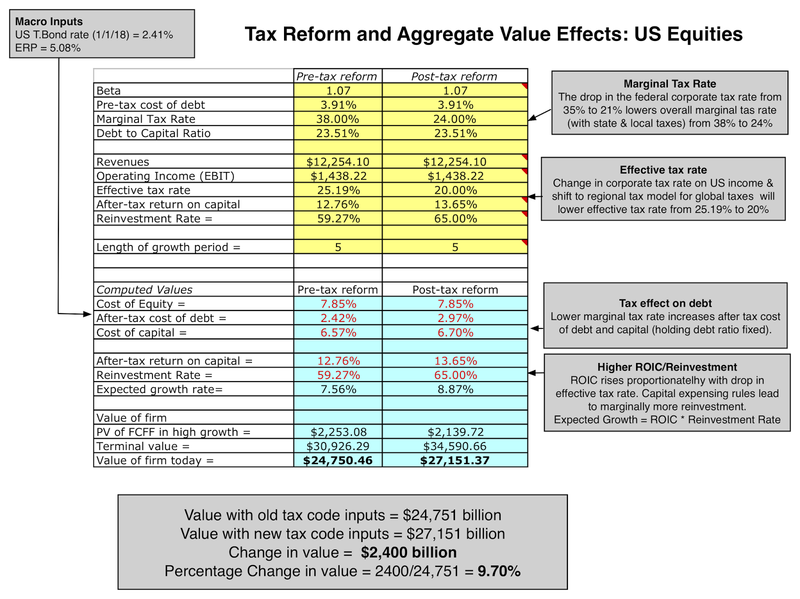 To assess the impact of tax reform on overall equity value, we have to move through each dimension of value. In making these assessments, I will focus on non-financial service firms, partly because the tax effects on debt and value are cleaner and more transparent. The Cash Flow Effect: The cash flows that a firm generates on operations are after taxes, but the relevant tax rate is not the statutory tax rate but the effective rate. It is true that the reduction of the statutory tax rate from 35% to 21%, will reduce taxes paid, but the reduction will be from the aggregated effective tax rate that companies paid in 2017, not the marginal rate. Based upon my estimates, in 2017, US non-financial service companies reported $330.8 billion in taxes on taxable income of $1,342.1 billion, translating into an effective tax rate of 25.19%. Since this tax rate includes state and local taxes and taxes on global income, these companies were paying an effective federal tax rate of closer to 23% on all of their taxable income in 2017. With the drop in the US corporate tax rate and the shift to a regional tax model, we would expect this tax rate to drop, but the magnitude of the decline is likely to be far smaller than optimists are assuming. My guess is that the effective tax rate next year will be about 20%, including state and local taxes, after the tax rate changes, resulting in an increase in after-tax operating earnings of approximately 6.67% [(1-.20)/(1-.2519)] in the next year. The Cost of Capital Effect: The cost of capital is a weighted average of the cost of equity and the after-tax cost of debt. 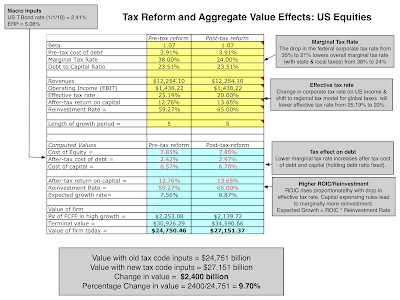 In computing the after-tax cost of debt, the tax rate that matters is the marginal tax rate on US income, since even companies that have low effective tax rates, like Apple, have found it in their best interests to borrow money in the US and set off interest expenses against their highest-taxed income. The marginal tax rate for a US company in 2017 was close to 38%, with state and local taxes added to the US federal tax rate of 35%. Moving that tax rate down to 24% (my estimate of the marginal corporate tax rate, with state and local taxes, in 2018) will increase the after-tax cost of debt. In 2017, US non-financial service firms collectively reported a debt to capital ratio, in market value terms, of 23.5% and faced a cost of equity of 7.85% and a pre-tax cost of debt of 3.91%. With a 38% marginal tax rate, that would have resulted in an after-tax cost of debt of 2.42% and a cost of capital of 6.57%. Keeping the pre-tax cost of debt and debt ratio fixed, and reducing the marginal tax rate to 24% will increase the cost of capital to 6.70%. The Growth Effect: The growth effect is the trickiest one to assess, since the value of growth is a function of both how much companies reinvest but also how well they reinvest, measured as the return they earn on investments over and above their cost of capital. We do know that the incentive to reinvest has increased, especially at companies with physical and depreciable assets, because of the capital expensing provision and we also know that excess returns will change, as after-tax earnings and the cost of capital go up. In 2017, non-financial service companies in the US collectively reinvested 59.27% of their after-tax operating income back into their businesses and earned a return of 12.76% on their capital employed; the sustainable growth rate, if those numbers are maintained, is 7.56%. Increasing the return on capital to reflect the growth in after-tax earnings yields 13.65%, and assuming that reinvestment increases marginally to 65% of the after-tax earnings, because of the capital expensing rule change, yields an expected growth rate of 8.87%. In making my estimates, I have assumed that the revenues and Note that this is the estimated increase in firm value, but equity value will rise proportionately, if the debt ratio remains unchanged. Does this mean that stock prices will rise 9.70% over the next year? No, and here is why. This tax reform package has been floating around for almost a year now and investors have had a chance to not only read it but incorporate its effects into prices. While the final package contained some surprises, the final version of the bill preserved the key ingredients that we introduced in April 2017. The strong returns posted by US stocks last year already include some of the value effects of the tax law. Note that this does not mean that the effects of the new tax code have already worked their way into prices since we still do not know how companies or the US economy will respond to the changes. This analysis is static, insofar as it does not allow for the changes in investing, financing and dividend behavior that we will see, as a consequence of the tax change. For instance, firms may decrease how much they borrow, since the tax benefit to debt has decreased, and that will lower debt ratios and change the cost of capital further. All the caveats apply, insofar as we are using effective tax rates and capital expenditures for one year (2017) to make the comparisons. There is one sector, real investment trusts (REITs) that showed up the loser trifecta but it's special tax treatment (where its income is not taxed, but passed through) led to its removal from the lists. Again, this should not be taken as an indication that the market will look favorably on the benefited sectors and punish the hurt sectors, since market prices have had time to adjust to the expected tax code changes. In a later post on how the pricing varies across the sectors, we will revisit this question. Taxable income and tax rates: Facing a more benign domestic tax environment, will companies be more expansive in their measurement of taxable income? How much of this income will they pay out in effective taxes? Capital Expenditures in tangible asset sectors: The capital expensing provision should make investing in depreciable assets more attractive, but will that be sufficient to induce companies to reinvest more? If so, how much? The Untrapping of Cash: How much of the trapped cash will companies bring back home, paying the one-time tax penalty? Will they reinvest this cash or return it (in the form of dividends and buybacks)? The Debt Shift: Will highly levered businesses react to the reduction in tax benefits from debt by retiring debt? What effects will a system-wide delevering have on bond default spreads? On top of these company-level concerns are questions about how the economy will react to the tax changes, how much of the benefit will be redirected to employees and what effect there will be on interest rates. It is going to be an interesting year! How do we take into account the limited interest deductability (30% of EBITDA/EBIT) in an FCFF valuation? I find there is an inconsistency with your evaluation of the effect on tax reform. In your previous valuations of individual companies (Apple March 2016) you take their current effective tax rate and slowly increase it until their terminal tax rate is 35%. With this back of the napkin analysis, you have not done this. The terminal rate for companies will be 35% pre-tax reform and closer to 20% post tax reform. That has an outsized effect on valuation as you may know. In addition, the marginal tax rate when calculating cost of capital should be higher post tax reform since companies may move debt over to countries with higher marginal tax rates (I.E. Europe and Canada). These changes applied to your March 2016 Apple valuation increases the value of that company by 15%. Here is the reason for the change. The biggest reason for the difference between marginal and effective tax rates in the old regime was foreign income, which companies held outside the US to avoid paying the differential tax rate. Since the law required that the differential tax eventually be paid, I tried to move tax rates to the US marginal tax rate over time. That is no longer the case, since the US has moved to a regional tax model. That would mean that if you are a multinational with half your income in the US, with the tax rate of 21% and half in Hong Kong with a tax rate of 15%, you would pay 18% of your income in taxes, without any additional tax deferrals. Thanks for the reply. My point was that for pre-tax reform valuations, you use a 25.19% tax rate for your terminal value in the spreadsheet. In reality that number should be closer to 35% since pre-tax reform, all companies needed to eventually pay that 35% marginal rate, like you said. Post-tax reform, the marginal rate for the terminal value can stay at 20% reflecting the changes in the law. You allude to covering this in a future post, but to what degree were these effects known or knowable by institutional investors? You state that key provisions had been circulated since April 2017, but in March Speaker Ryan had already pulled the House vote on ACA repeal and replace once. As late Spring and Summer continued, I think most of us viewed tax reform as a political long-shot given the GOP's inability to deliver on key legislation. Not that this amounts to data, but many of my colleagues and I didn't think the tax reform would pass even as it went into reconciliation committee. So if, for example, a person were to value a private company as of September 30, 2017 to what extent should the tax reform be included? Thank you for this timely and helpful blog post. Regarding the effect of capital spending, you appear to have used CapEx / Market Cap as the metric to gauge the effect of the allowances that the new tax law is making for investment spending. Did you consider using CapEx / EBIT? I think it is a metric that is at your disposal and it seems to be more relevant term, especially since market cap is somewhat colored by perception. If you did consider it, would you (or anyone else willing) mind explaining why it made for a superior metric? Great post. Is there a list of companies that fall under each of the industries named in your spreadsheet?